Over the past few months I've received emails from a number of teachers, principals and university students asking me for my opinion about whether Modern Learning Environments (MLEs) are appropriate for particular sorts of learners. This weekend I received on from a Masters student asking for my gut feeling as to whether dyslexic learners in a MLE thriving or barely surviving? Inevitably my response is "it depends". Essentially, I don't find this sort of question helful. There are some more important questions that should precede it. That’s not to be dismissive at all of the fact that people will be interested in these sorts of things – it’s important that these themes are fully investigated as new approaches are being adopted in our schools and learning institutions. It's like asking "does an MLE suit all learners?" when the equally valid, yet often unconcested question is "does a traditional egg-crate classroom suit the needs of all learners?" There is an assumption implicit in the question that the experience of learners in an MLE will be different in some way to what they are within traditional environments – and that the environment will be the differentiating factor. It highlights concerns that exist about the move to more open environments generally – behind which lies a lot of assumptions about the efficacy of the traditional single-cell classrooms that most of my generation will remember and which still exist in the majority of cases today. Think about this – what is not 'open plan' about the conventional classroom, with rows of desks facing the focal point of the teacher at a presentation point in the room. Or not even rows but groups of desks etc. At the end of the day it's still an open space occupied by 20-30 people all engaged in some form of learning activity. The opportunity for distraction exists, along with the assumption that all learning will take place at the individual desk/chair arrangement assigned to each learner – with little (or in most cases no) opportunity to withdraw to a space for personal reflection or focus if required. To clarify my thinking here let’s start with the definition of a MLE. My perspective of a MLE is that it will generally demonstrate following characteristics..
That’s about it as far as the physical spaces are concerned. The essential thing then is, what are the (desired) characteristics of the teaching and learning behaviours within these spaces – and that’s where the whole issue gets interesting. To be honest, this is the question that ought to precede any thinking or design about the spaces themselves – this is the basis of work that I am doing in many schools currently under the umbrella of ‘modern learning practice’ – exploring just what it is that is either not working or limiting the opportunities for learners to learn within our current ways of working, and changing practice appropriated, including the spaces we operate within. teachers working collaboratively with larger numbers of students, ensuring the needs of particular groups and individuals are being met while others are working in self directed groups etc. greater focus on self directed learning, including emphasis on learners taking more responsibility for accumulating evidence of their learning for assessment purposes. Each of the ideas above assumes a lot of thinking leading to this change from the way things are done currently in the egg-crate, single cell classrooms with one teacher conducting the orchestra of 25 or so kids. So, to come to the inquiry around whether learners with dyslexia (or any other learner group defined by need) have their needs met in a MLE, the inevitable response is “it depends”. how are their needs defined currently, and in what ways are they being met adequately and appropriately in current contexts? What changes are desirable to current practice that would mean these needs may be better met? How may an adjustment in the design of learning spaces be of benefit? From my personal experience, I’ve seen the needs of learners with all manner of disability being met in much better ways in a MLE than in a traditional classroom, and am philosophically disposed to advancing that approach. Similarly, however, I’ve seen some tragically disappointing examples of kids simply “getting lost” in the turmoil of an open plan environment where little thought or consideration has been given to the way teaching and learning practices must change to leverages the affordances of these new environments. So my feeling here is, to focus on the causal relationship between the physical environment (MLE) and how the needs of particular learners are being met is to limit the scope of wider thinking and engagement that needs to occur. But let's not stop asking the questions – instead, let's be prepared to dig deeper into examining the reasons behind why educators and education systems around the world are moving towards creating markedly different sorts of learning spaces to what we have been used to. And let's also start to focus on the MLP horse before the MLE cart in the way we approach this. 3 Responses to Does a MLE suit all learners? I agree about MLP coming before MLE. I think in my own mind I have been using the two terms interchangeably. I have loved working in a mle for 18 months now and have been asking myself similar questions in response to feedback from students and parents. I think your point about traditional classrooms and if they met/meet the needs of our learners is a good one. 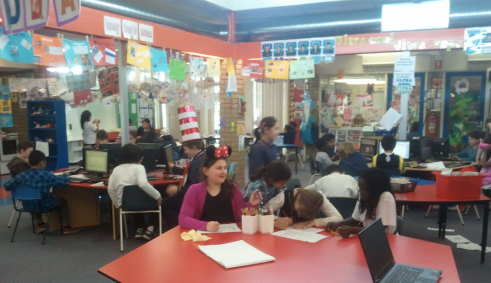 No learning environment suits everyone but I think an mle can meet more needs in more ways. What a great question and line of inquiry. One that I am keen to research as part of my masters in specialist teaching. It is often quoted to help students with diverse needs such as ASD, ADHD etc… : "It is easier to change the environment than to change the child" Current interventions for diverse students often include, the use of technology, quiet calming down spaces, flexible learning and/or furniture as well as a differentiated programme. I do agree with the comment that MLE will meet more needs in more universal ways.